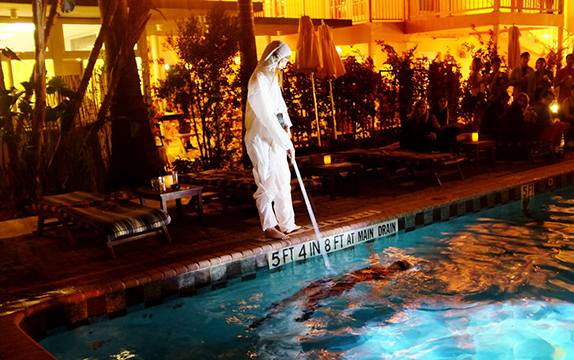 Meriem Bennani and Hayden Dunham present IN LIGHT, an performance and video installation that utilizes the swimming pool of the Freehand Miami hotel. As in Dunham and Bennani's previous collaborations, including their prior exhibition at SIGNAL, IN LIGHT sees the artists combining elements of performance, design, and technology in a hypnotic meditation on light and space. Performance by Hayden Dunham and India Salvor Menuez. This one-night event during Art Basel Miami is organized by NEWD ART SHOW and UOVO, presenting site-specific projects by SIGNAL, Brooklyn and METRO PCS, Los Angeles. See images from purple DIARY. See mention in the New York Times.